I made a few little changes to the living room over the weekend, and I am absolutely loving them! Since I've been drenching my house in blue lately (as seen here and here), I decided to bring some blue into the living room. Really, it started when I found some blue curtain panels I had never used. I decided to make pillows from them, and it kinda unraveled from there. I think the new pillows bring great color into the room. After making the pillows, and loving the color, I decided I needed more blue. 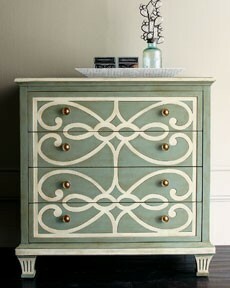 If you've been following me on Facebook, you know that I absolutely fell in love with the pattern on a Horchow dresser. Over the weekend I decided I wanted to use this pattern on a giant painting. I switched the colors around because I wanted the painting to be mostly white so it would 'pop' against the beige accent wall. And then I spent several hours drawing out my design, and then painting, painting, painting! I just love it! This wall really needed something BOLD and a bit colorful, and I really think this does the trick! I also think it's great to have a big, bold pattern somewhere in the room since all of the pillows and upholstery are solids. I also added a big silver mirror opposite the painting. I struggle with decorating this wall, so I'm just not sure about the arrangement. Basically, I'm just waiting until we can mount our TV above the fireplace on the opposite wall, and then move a couple chairs against the current wall. I also tinkered with my favorite little mirrored tray that sits on the ottoman. I painted it with my favorite blue paint. And I also painted a little blue planter near the fireplace. I also took down my giant gallery wall and brought the skeleton key silhouette gallery wall from the guest bedroom in here. I really like it in here and will figure something else out for the bedroom. I'm sure this room will likely be changed about 100 more times in the next year. I cannot sit still when it comes to this room. Ultimately, I think it needs other colors than blue, but I just have to think on it for a bit. This room is still a work in progress (much like myself), and I'm still tinkering with it and trying to get it right. I know I still have a long way to go. But, I think it's a huge improvement from when we moved in. You see more about the very beginnings of this room here. Better, but too much beige. A bit more colorful! What color do you think I should add? Suggestions? While looking for the 'before' picture I came across about 20 different pictures of this room from the past year that I've been hoarding on my computer, and they're all totally different. It's so hilarious and made me realize I've really come a long, long way from when we first moved in 2 years ago. I'm definitely a 'novice' designer and the only way I know to learn is through trial and error. And I've made some huge errors along the way! I'm going to share with you ALL of those horribly embarrassing 'design flops' tomorrow (you can read that post here). It's going to be a truly amazing, totally giggle-inducing post, so come visit me tomorrow! I LOVE your art piece! You asked about how we like it on the wall. Well, personally I would get another mirror like the big one on that same wall. I think that would look awesome! Then I'd put that totally fab art you did on the wall above the sofa. Position it between the framed skeleton keys and use those other two mirrors elsewhere. Perfect touches of blue! Wonderful job! Love it! the room looks so much bigger from the before to the after and the blue is SWEET! I absolutely love this space! I was flip-flopping on the color to redo some wall art, sticking with white and grey now! I love how fresh it looks! I think coral would be a nice accent color to pair with the blue. I love your couches. Where did you get them? WE have a huge, long living room and right now our enormous sectional looks blah in there and can't be moved into a different spot or configuration. I thought two couches would be a much better look. Can you please please please tell us where you got your couches? I adore them.